Cora and her husband, PGA golf pro Steady Eddie Timms, live in a safe gated community, so when Cora witnesses a murder, she’s shocked and frightened. But without a body, murder weapon, or evidence of a crime, Cora’s sanity is called into question—especially when it comes to light that Cora’s not been dealing well with the stress and grief of losing a daughter, and her memory of late hasn’t been all it should be. Determined to prove her sanity, Cora bursts into a flurry of danger and unanswered questions as she sets out to find evidence of foul play. With the help of a bumbling security guard, a loyal best friend, and a neighbor's yappy dog, pieces finally fall into place. By all appearance, the mystery is solved...until Cora is kidnapped and implicated in a case of hidden identity and an old embezzlement scheme. It will take more than the national attention garnered from Steady Eddie’s status to clear Cora’s name, rescue her from the kidnappers, and help find her way back to the peace and sanity found only in God’s loving arms. Cora Timms was a three-wheeled trolley ride away from a nervous breakdown. Her neighbor, Patrick Hyde, warned her of a prowler in the neighborhood. She ran to lock the doors. Where was Ed? He should’ve been home hours ago. The sharp ring of the phone cut through the air, and sent shivers jolting down her spine. Another ring. Was it Ed, or…the wretched man who’d harassed her for several weeks? The thunder of the Arizona monsoon fed her near-phobic state. She was worried about her husband. She had to answer. Cora held her breath as the caller’s gruffness accosted her ear. Her nervous fingers punched the off button of the cordless phone as her throat tightened with pent-up screams. She wiped perspiration from her hands and dialed her friend. The living room draperies billowed as Cora yanked them closed. Why hadn’t Ed taken the calls more seriously? Where was he, anyway? Had he drowned in a flooded ditch, like their daughter, Vanessa? Her stomach coiled. Determined to keep her mind off negative thoughts, Cora headed for the kitchen. The rich scent of coffee grounds permeated the kitchen as she counted scoops. Cora filled the glass carafe with water, and wiped the bottom with a linen towel. She jumped as a loud thud outside grabbed her attention. What was that? A movement on the patio. Lightning flashed and illuminated two obscured figures struggling in the torrential rain. She gasped and choked back a cry. She set the carafe on the counter, and stretched across the sink to lock the window. Her elbow hit the glass pot and knocked it to the floor with a crash. The next burst of lightning revealed only one person, his hooded face staring at her. Cora screamed and jumped back in alarm. Her foot slipped. The world tilted and went dark. Her eyes fluttered. She heard her name again, inviting her back to consciousness. Dazed, she blinked several times as her elderly neighbor came into focus. Dr. Sam Richmond sat on the floor beside her, and lightly smacked her hand. A mix of spicy aftershave and coffee hung in the air. She turned. A coffee can rested beside them, its grounds strewn about with broken glass and water. Dr. Sam’s white shaggy-dog eyebrows bobbed above pop bottle glasses, which magnified his eyes. A shock of unruly white hair topped his forehead, where drops of rain beaded. She released the death grip on the older man’s arm. Years of trust between them should’ve brought reassurance. Why did she feel so uneasy? Another flash of lightning filled the room. She covered her eyes while images popped into her mind, again. Two men wrestled on the patio…and then, only one. Could one have been Sam or…her husband? Cora shuddered at either possibility. As Sam scooted forward on the rubber mat, caked mud fell from his shoes. Maybe he was one of the men outside the window. She suppressed the negative thought. He smiled and patted her arm. “You and me both, Cora. Here, take my arm. Let’s see if you can sit. Easy does it.” Dr. Sam’s manner, as always, was professional and dignified. He changed positions and braced her with his left hand. The room doubled as Cora sat up. Two Sams and four magnified eyeballs swirled in front of her. “That’s far enough, Sam.” Her voice shook. “I’m woozy. Where’s Ed?” She blinked and attempted another peek as Dahlia McGibbons’s familiar Texas drawl came from the dining room. As Dahlia spoke, worry bounded through Cora. 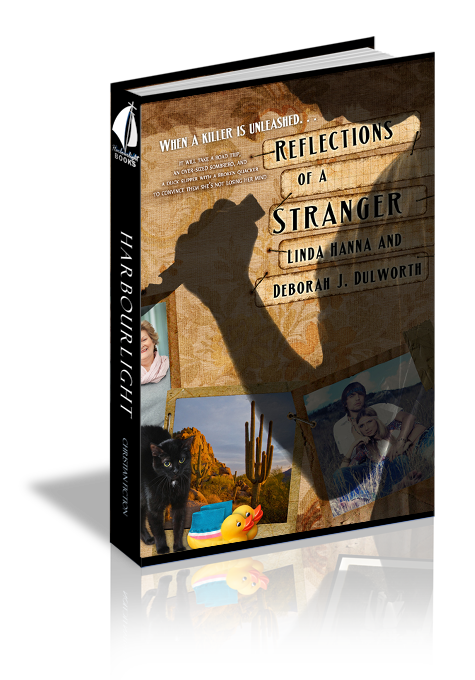 The bits and pieces of memory confused her, like two jigsaw puzzles in the same box. Oh, yes, Ed was late. Now that she remembered with great clarity. Her teeth clenched. ‘Late’ would’ve been twenty minutes, but two hours? That’s more like…missing. She was glad he’d made it home safely, however, once her backside was off the floor, he was dog meat. “She’ll be just fine.” Sam shifted to face him. “We’re trying to figure out how to get off the floor. Wanna give us a hand here, buddy?” He raised his arm for assistance. Dahlia came into the room. Her signature flippy, dark hair, still damp, had been whipped and tangled by the storm’s gale. “Like he said, ya was out cold. Wendell Floyd hot-footed it next door to get Sam.” Her bracelets jangled when she placed a cool hand on Cora’s forehead. “Well, it’s my sworn duty as senior secur’ty guard to ask questions,” Wendell griped. The older man waved. “Don’t mention it. Glad to be of help.” With his medical bag in one hand, he reached for his umbrella with the other. “I don’t know why I brought this thing. The wind’s too strong for it. ‘Night, now.” Lightning flashed as Ed opened the door. The doctor hesitated before stepping into the deluge. “Is that when you passed out?” Ed lifted her hand and kissed it. “Let’s see. I was putting the kitchen window down, and then, I-I saw them.” Weariness weighed her down. Their home, in this gated community, had always been a safe haven. It certainly wasn’t now. Not with the phone calls and two strangers fighting on her patio. She felt violated and vulnerable. A frown creased Cora’s forehead. “I know the difference between a man and a cat, Wendell.” She brushed coffee grounds from her stained pant leg. “You’re not listening, Edward.” Cora’s eyes flashed. “It was not my reflection. I saw two people out there! They were fighting and one of them fell.” She frowned. Question 1: How did Ed and Cora react differently to their daughter's death? Answer 1: Ed relied on God through his grief. Cora felt Ed was forgetting Vanessa and betrayed their daughter's memory. She couldn't bring herself to do that. Question 2: How did Cora behave when she felt God was silent during her time of sorrow? Answer 2: She blamed God and withdrew from life. Question 3: Why did Cora fear her husband finding out her secret? What finally put her fears to rest? Answer 3: She was afraid of losing Ed's love. Once they were able to talk about it, Ed's confession of undying love put her mind at ease. Question 4: Why didn't Ed and the police believe Cora's story of a stalker? Answer 4: Cora was worried about her secret coming to light, and her nervousness made her appear guilty. Question 5: Would Cora's circumstances have been easier if she had confided in her husband at the onset of her problems? Question 6: Who supported Cora and why did it take so long for others to get behind her? Answer 6: Wendell was the first to back her. He wanted to be accepted and recognized. Without witnesses or evidence, her story didn't appear credible. Question 7: What does the Bible say about peace? Answer 7: John 14:27 "Peace I leave with you, my peace I give unto you: not as the world giveth, give I unto you. Let not your heart be troubled, neither let it be afraid. Question 8: What are two ways God's perfect timing was manifested in Cora's life? Answer 8: He protected her during the car chase. Neville Neubauer saw the TV program that led him to call Nonie. Question 9: How did Jocelyn's talk with Cora help heal the pain of Vanessa's death and help their relationship? Answer 9 Cora learned Vanessa wasn't forgotten. She also discovered she didn't have all the facts and judged James and Jocelyn out of spite. Question 10: Do you have sympathy for Rita? For the caller? Answer 10: Rita's love of money trapped her in an abusive relationship. The caller's greed turned him angry and hateful. Both characters were miserable without God. Matthew 5:44 tells us to love our enemies and pray for them.